Which Version of Firefox Am I Using? Firefox isn’t the go-to alternative browser that it used to be, but it’s still a favorite among power users and open source advocates. Here’s a brief guide on how to find out what version of Firefox you’re using…and what the different versions actually mean. 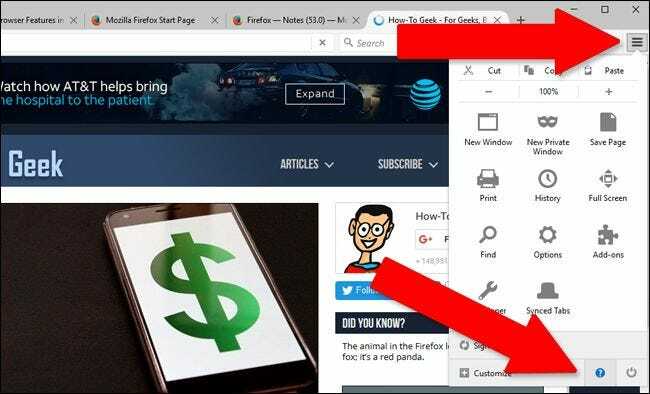 In the latest versions of Firefox on Windows or Linux, click the “hamburger” menu in the upper-right corner (the one with three horizontal lines). The small window that appears will show you Firefox’s release and version number. Click “What’s new” for a look at the release notes. Release Versions: How Stable Are You? Firefox comes in four primary versions: the standard release, the beta version, the developer edition, and nightly builds. Here’s what that means. 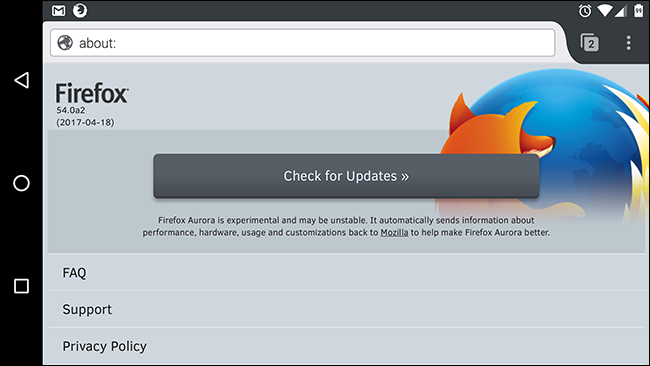 This is the current release of Firefox, the one that the vast majority of users have installed. All the features have been thoroughly tested and are ready for use by the general public. Users of the stable release don’t get access to the newest tweaks and features, but it’s the one you want if you don’t like surprises in a crucial tool on your computer. The beta release is one “version” ahead of the stable release—at the time of writing, the stable build of Firefox is on version 53, but the beta is on version 54. This version is for those who want access to the new features a little faster. Features that make it to the beta are generally on their way to release, though they may not necessarily get there in the very next release. The developer edition of Firefox is just what it says: an even earlier release primarily intended for developers of websites and Firefox extensions. This release may include more major tweaks to both the program and the Gecko rendering engine, some of which will graduate to the beta and stable versions, some of which won’t. Most end-users don’t need to go near the developer edition, unless they’re really interested in a new feature in particular. It’s considerably less stable than the full release. The nightly build includes cutting-edge updates from the open source Firefox project, actively fixing bugs and testing out new features. Newly-compiled versions of the browser are typically available every weekday, at the very least. But those fixes often come with program-breaking bugs of their own, frequently creating errors in rendering and extension compatibility. 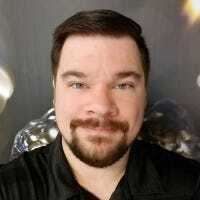 The nightly releases are only for the bravest of end-users who want to see the absolute newest in Firefox development, or for developers who need to see how their products will work with potentially problematic branches of the program. Firefox on the desktop is available for Windows, macOS, and Linux, but there are mobile versions available as well. On Android’s Play Store, the program is available in stable, beta, and “Aurora” (developer) versions, with releases generally corresponding to the desktop versions. A nightly release is available as well, but it has to be downloaded manually on this page and installed as a non-Play Store APK file. Since iOS is a more closed platform, only the stable release of Firefox is posted to the App Store. iPhone and iPad users who want to test out more recent versions need to enroll in Apple’s TestFlight program for Mozilla apps. 32-bit vs 64-bit: How Much Memory Can Firefox Use? Though just about every modern operating system has moved to 64-bit processing as a de facto standard, Firefox’s default download pages still direct most users towards the 32-bit version of the program. This is because the newer 64-bit releases for Windows and Linux still have some compatibility issues with older plugins. For power users who want Firefox to have access to as much memory as possible, this download page includes the latest 64-bit releases of the stable version of the Windows and Linux releases. On macOS, Firefox is a 64-bit application by default.